Offering self-contained accommodation and a convenient range of onsite facilities in stunning Sandy Bay, Apartments at Woolmers is just 1km from Hobart's city centre in a harbour side suburb just minutes from Sullivan's Cove, Salamanca Market, Battery Cove and Wrest Point Casino. Conveniently located in the centre of the CBD, Best Western Hobart offers contemporary elegant accommodation surrounded by a wide range of shopping and dining options including the iconic Salamanca Markets as well as an historic waterfront precinct ideal for a relaxing stroll. Hotel Grand Chancellor Hobart is located along the waterfront within close proximity to the central business area and many popular tourist attractions. A great 4 star property with many luxurious amenities and facilities ensuring you have a comfortable stay. Offering deluxe accommodation in an historic sandstone mansion built as far back as 1874 and more recently restored to full glory, Lenna of Hobart features spacious accommodation and quality onsite facilities just minutes from popular local attractions and day trips to Port Arthur, Mount Wellington, Tahune Air Walk and more. Just minutes from art galleries, restaurants and some of the finest wineries in Tasmania, Mantra Collins Hotel offers deluxe accommodation on the Sullivans Cove waterfront. Close to Hobart's CBD, the hotel offers hotel room or apartment accommodation and a fantastic range of onsite facilities. 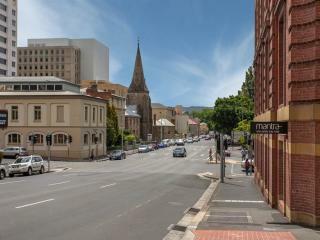 Offering elegant accommodation in a heritage building opposite St David's Park, Mantra One Sandy Bay Road features self-catering studios and apartments surrounded by shopping, dining and recreation options, local tourist attractions, Sullivan's Cove, the Hobart CBD, marina precinct and more. Just minutes from the Royal Botanic Gardens and a short drive from attractions such as the Tahune Airwalk, Russell Falls, Richmond and a number of wineries, Quest Savoy offers deluxe accommodation and a fantastic range of onsite facilities near the waterfront of central Hobart. Offering stylish accommodation in the Heritage Listed buildings of Trinity House 1840 and Christ College 1929, Quest Trinity House enjoys a convenient range of onsite facilities in historic North Hobart. 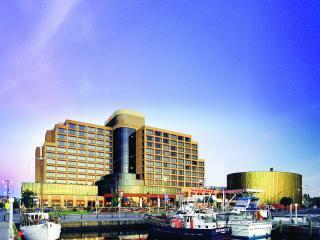 Surrounded by local attractions including Salamanca Place and Battery Point, the lodge is just footsteps from the waterfront. Offering affordable accommodation in the heart of Hobart's historic Sullivan's Cove, Quest Waterfront enjoys a convenient location within walking distance of waterfront shopping and dining. 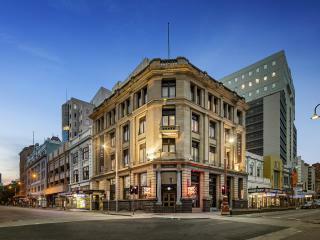 The hotel is also just minutes from attractions such as Salamanca Place, the CBD, Constitution Dock and the Elizabeth St Pier complex. The unique location of Salamanca Suites, surrounded by old converted warehouses and sandstone buildings, offers a trendy historic meets modern atmosphere around this contemporary accommodation. With major attractions and award winning dining options just minutes away, there's plenty to see and do. Offering comfortable accommodation near the waterfront of Sullivan's Cove, Salamanca Terraces is located on the eastern end of famous Salamanca Place, within walking distance of shopping, dining, entertainment and the iconic Salamanca Markets held each Saturday. Built in the 1930s, the Elizabeth St Pier is an award-winning landmark on the waterfront that has been restored to full glory and is now home to Somerset On The Pier, luxury lifestyle accommodation offering picturesque views of the Derwent River and Sullivan's Cove and surrounded by history and attractions. Centrally located to some of Hobart's most popular attractions including Salamanca Place, the Botanical Gardens, Queens Domain, the CBD, Theatre Royal, Aquatic Centre and waterfront, The Old Woolstore offers modern accommodation with all the comforts of home in a unique setting. Offering convenient, comfortable accommodation central to the city, Travelodge Hobart features a basic range of onsite facilities and is just minutes from shopping and dining, iconic Salamanca Place, the waterfront and the historical area of Battery Point. As the name suggests, Waterfront Lodge Motel enjoys a picturesque position on the banks of the Derwent River, just minutes from central Hobart. The comfortable accommodation enjoys a convenient range of facilities and is close to a number of popular attractions and destinations. Offering luxury accommodation on the waterfront, Wrest Point is nestled on the banks of the Derwent River and enjoys an excellent range of onsite facilities surrounded by shopping, dining and attractions. The famous Salamanca Markets are just a short ferry ride away and historic Port Arthur just a quick trip in the seaplane.